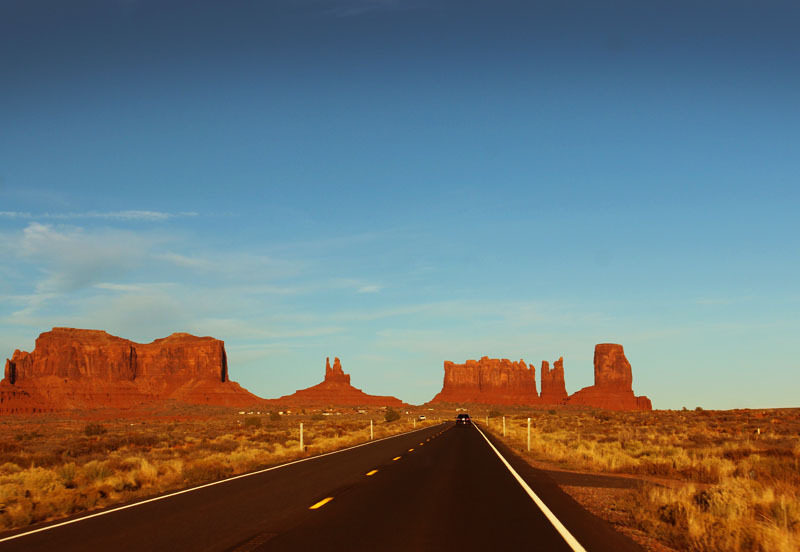 This is a place that should be on every bucket list … a remote area in northern Arizona at the Utah border that holds high reverence on must-see destinations — Monument Valley and it’s Mittens. 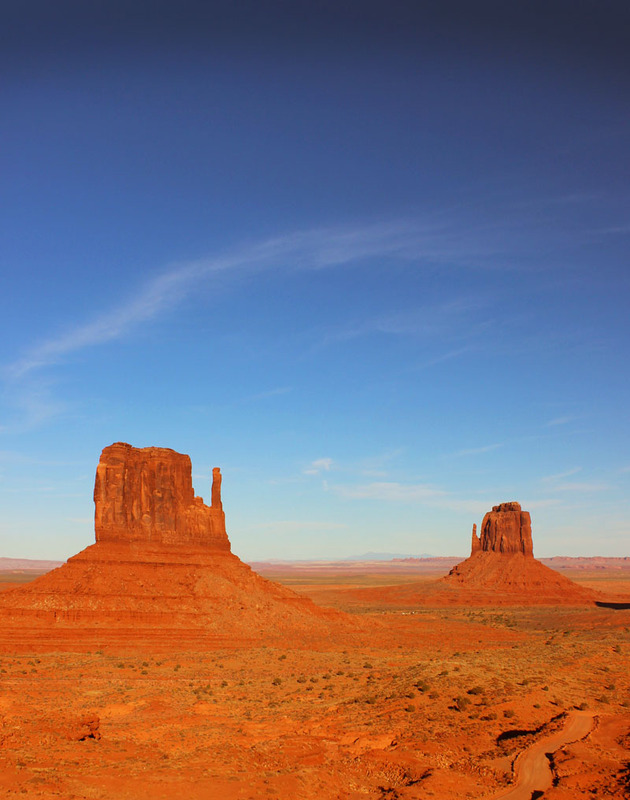 A treasure of iconic landmarks located on the Navajo Nation, it was brought to the forefront when John Ford captured on film The Mittens in the 1939 epic movie Stagecoach, one of John Wayne’s legendary movies, among many other subsequent films located there. 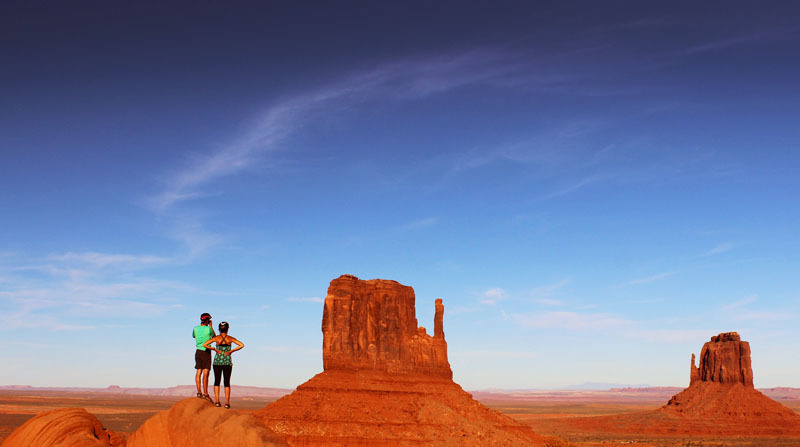 The towering red sandstone buttes and mesas take your breath away as their sunbaked earthen sculptures contrast with the intense blue Arizona skies. Orange and blue are opposites on the color wheel and this makes everything POP! Look very closely at the above photo, the shape of a shadowy Mitten can be seen on the very left side of the blue rock formations. Onward to the main event, a 1,000 foot elevated drive off the barren desert floor to the cliffs and buttes cutting unusual organic shapes on the horizon. 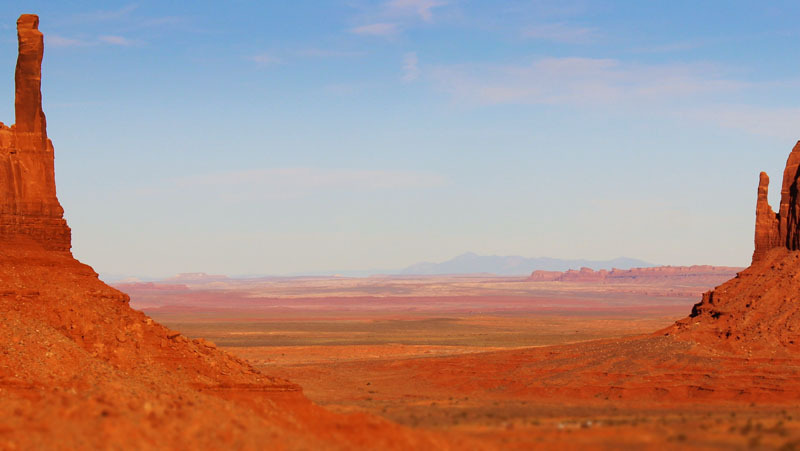 They change dramatically as you reach Monument Pass through the mesas, as the sun ignites the massive rock formations to their bright, pre-sunset red-orange color. 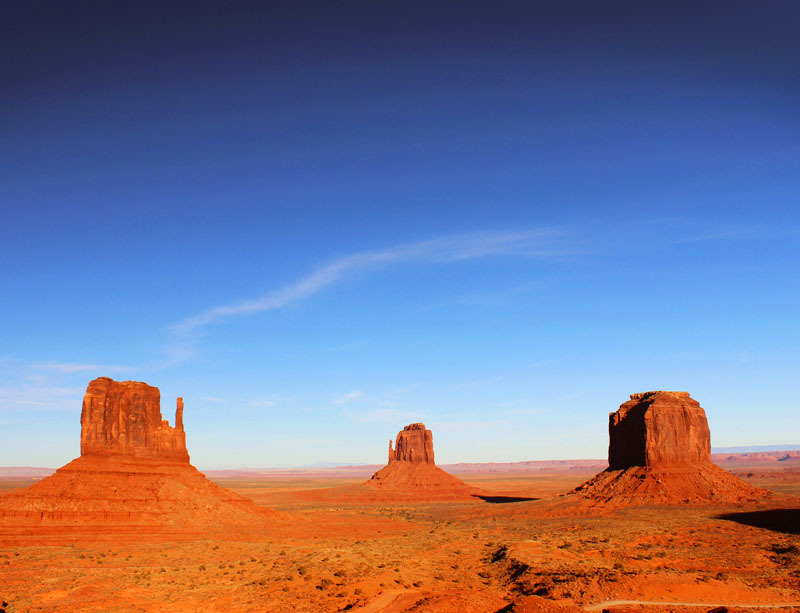 At the Monument Valley Navajo Tribal Park to the Mittens there is an entrance fee covering a 2-day visit. Ample parking is straight ahead to the visitor’s center, The View Restaurant and Hotel. Climb out of your car, look to the left and The Mittens are right there. Like two friendly gigantic sculptures waving to everyone from the wide open landscape. This image (above) shows the lighting one hour before sunset — an optimal time for viewing and photos. Dozens of photographers appear to set up their tripods, ready to capture the sunset glow. As the sun drops lower in the west, the rich red land deepens. 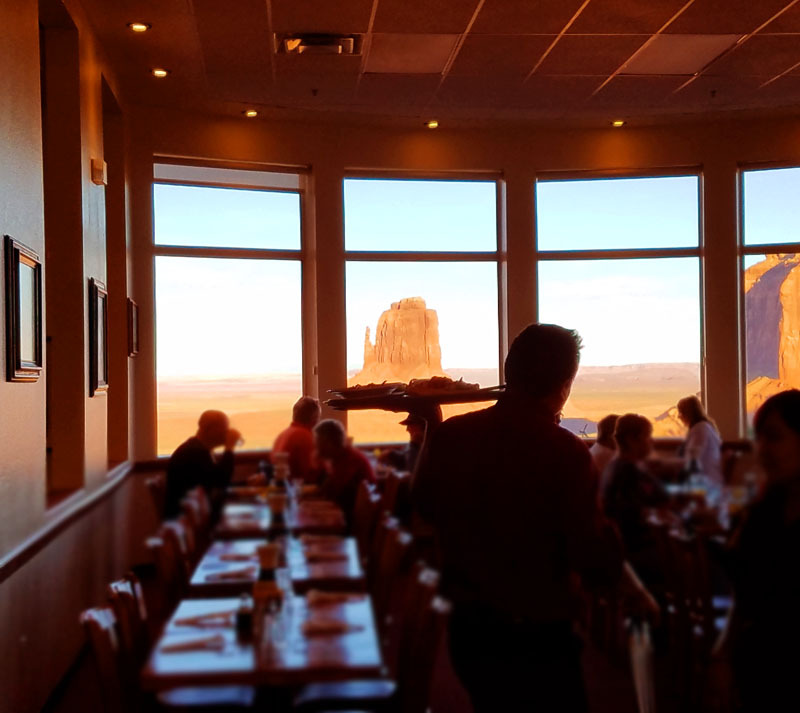 Something that may be of interest to residents of Southwestern Colorado in the Mesa Verde area … when you look between The Mittens in the far distance is Sleeping Ute Mountain, a beloved landmark of the region in pale pastel blue. His head is to the left, arms crossed over his chest as he sleeps. After 50+ photos we may have done The Mitten Pose where silly tourists position themselves in between the two buttes and hold their hands up mimicking mittens. We may have …. um … couldn’t say. Standing in silence. Finally. The Mittens. At sunset. People all around gazing out to this natural marvel of rugged beauty. 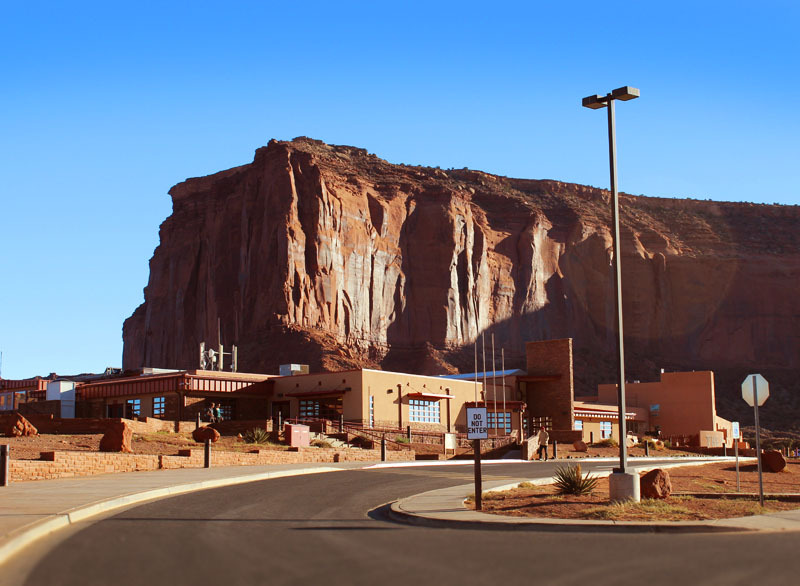 After taking in the moment, we recommend checking out the visitor’s center where there are exhibits, a huge gift shop with displays of souvenirs and artworks by Navajo artists, and The View Restaurant. We didn’t have a chance to stay or dine on this trip (another reason to return). Tip: there is an optimal photography position outside on the restaurant balcony called Photographer’s Point. You’ll find a plaque noting that Ansel Adams and other renowned photographers stood on that spot to capture this iconic landscape. 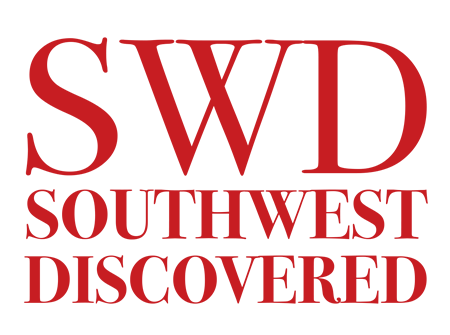 When people come to the Southwest, typically the most sought after destination is The Grand Canyon, as it should be as it’s one of the 7 Natural Wonders of the World. 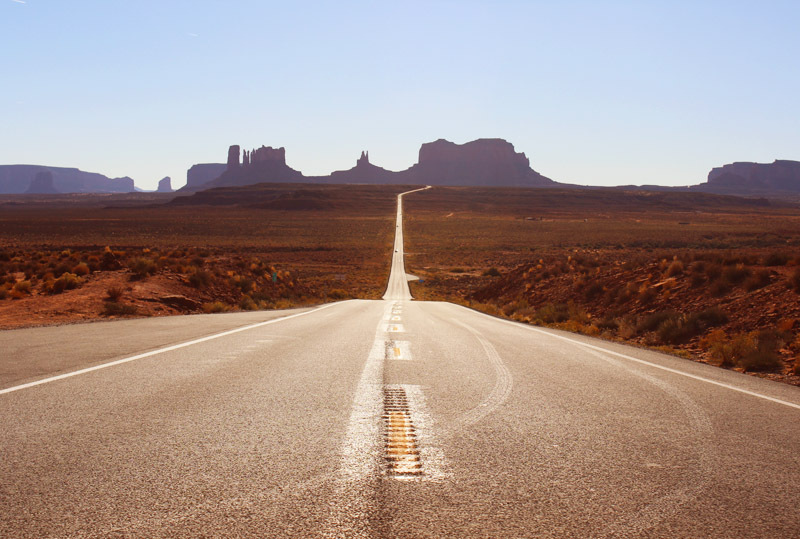 Of note, Monument Valley is only a 3-4 hour drive northeast from the Grand Canyon, depending how often you stop for sights along the way. We look forward to re-visiting this “valley of the rocks” again and again. We were there last year, stayed at the View Hotel, overpriced hotel. We drove our motor home but wanted to see the view from the hotel room. And the view was incredible. No, would not recommend the restaurant. Lilian, agreed … one of the most beautiful views in the SW. Thanks for the tips! This is beautiful! Thanks for the tour! Shannon & Drew, glad to have your company! You captured it beautifully. My bucket list is to see how many times I can go again! AZ, we see that you KNOW. We could go back time and again and always be amazed. 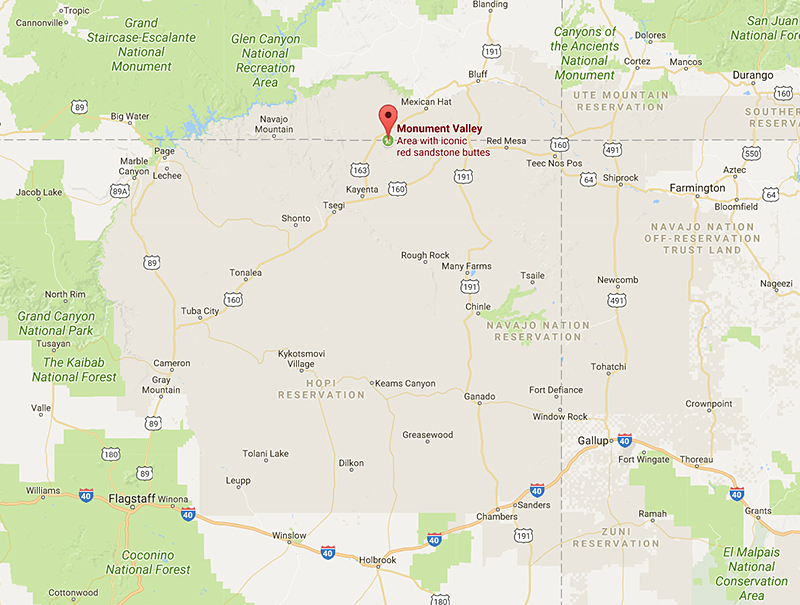 Had not realised Monument Valley was so close to Durango and Mesa Verde. Our trip to the west has broadened. Thank you. Linda, it’s a place like no other. When you go please send pics and we’ll share with everyone. Happy discoveries!